First Wednesday of every month - Theosophical Hall, Maid Marian Way, Nottingham - 7.30 for 8.00pm. Admission £4.50 (£2.50 unwaged). Home Previous Speakers Join Our Mailing List History of Empyrean What does "Empyrean" mean? Mar 2019 Sean Woodward "Journey To Zothyria"
Feb 2019 Shani Oates "The Wild Hunt"
Jan 2019 Anna Franklin "A Seasonal Talk"
Nov 2018 Heinz Frommann "The Secret Life of Trees"
Oct 2018 Ashley Mortimer "'THE' Book of Shadows"
Sep 2018 Suzanne Read "An Occult history of Alderley Edge"
Jul 2018 Dominic Wetherall "It's all Wyrd"
Jun 2018 Prof. Timothy Landry "Willful Things: Sorcery and Encountering Ritual Magic in West Africa and Beyond"
May 2018 Ross Parish "Votive offerings at holy wells, a historic and modern prospective"
Apr 2018 Carol Keith "Anglo-Saxon Magico-Medicine"
Mar 2018 Daryl Baxter "Mystery Religions and Paganism"
Feb 2018 Frank Wright "Medieval Graffiti"
Dec 2017 Ross Parrish "Christmas Customs of the East Midlands and their possible pagan origins"
Oct 2017 Frank Earp "Paranormal Nottingham"
Jun 2017 Finian Heavey "Theosophy, Paganism and the Aquarian Age"
May 2017 Bob Trubshaw "Anglo-Saxon Boundary Shrines of the Leicestershire-Nottinghamshire Border"
Apr 2017 Frank Earp "An evening of local Folklore and Mysteries with Frank Earp"
Mar 2017 Mike Hill "Radio Afterlife"
Feb 2017 Moira Hodgkinson "Elemental Pathworking"
Dec 2016 Gordon McGowan "Dowsing – A Tool for the 21st Century"
Oct 2016 Matt Arnold "Paganism and Christianity – Light in the Vesica Piscis"
Sep 2016 Moira Hodgkinson "Jazz Magic – witchcraft, spells and rituals"
Jul 2016 Mike Hill "Cardboard Henge"
Jun 2016 Cat Treadwell "Exploring Pagan Ministry"
May 2016 David Knight "The Masculine Principle in Pagan Spirituality"
Dec 2015 Dr Lindsay Davies "53 Ways to Stop Believing"
Nov 2015 Heinz Frommann "Beyond Duality - The Roots of Paganism"
Oct 2015 Tim Hewitt "Near Death Experiences"
Jul 2015 Shani Oates "Sacred Mask, Sacred Dance"
Jun 2015 Daryl Baxter "Ancestors & The Sky Gods"
Dec 2014 Bridgette Hamilton-Gamble "Eating Like the Ancestors"
Nov 2014 David Knight "Celt Boys & Injuns"
Oct 2014 Tony Rotherham "Robin Hood -The Man - The Myth"
Sep 2014 Moira Hodgkinson "Playing With Dollies"
May 2014 Andrew Roberts "An evening of spirit communication"
Apr 2014 Mike Mason "The Trials & Tribulations of Playing With Others"
Mar 2014 Frank Earp "The Survival Of Paganism In Nottinghamshire"
Jan 2014 Dave Howard "Bows An' Arrers (in a Nottingham accent)"
Nov 2013 Mike Hill "Poundland Paganism"
Oct 2013 Bee Amber Firechild "Pagan, folk and sacred songs to harmonise your soul"
Jul 2013 "An Evening With The Spider God"
May 2013 Richard Pattinson "Fun In A Yurt"
Mar 2013 Antonia Zenkevitch "The Hidden Divine Feminine"
Jan 2013 Asif & Pauline Qu "Your Inner Djinn"
Dec 2012 Forum Discussion "Paganism Today?" Apr 2012 Elaine Mein "Suffer Not A Witch To Live!" Mar 2012 Andrew Roberts & Guests "An Evening Of Mediumship"
Feb 2012 Daniel Bran Griffith "Pagan symbolism within the Sherwood Legends"
Jan 2012 Kristian Lander "Atlantis, The Celts, Fallen Angels & The Egyptians"
Nov 2011 Dr. Lyndsay Davies "Jung For Pagans"
Sep 2011 Mark Olly "King Arthur in the North"
Jul 2011 Antonia Zenkevitch "Mermaids and Sea Lore"
Jun 2011 Mike Hill "Dr Frankenstein: What's the Worst That Could Happen?" 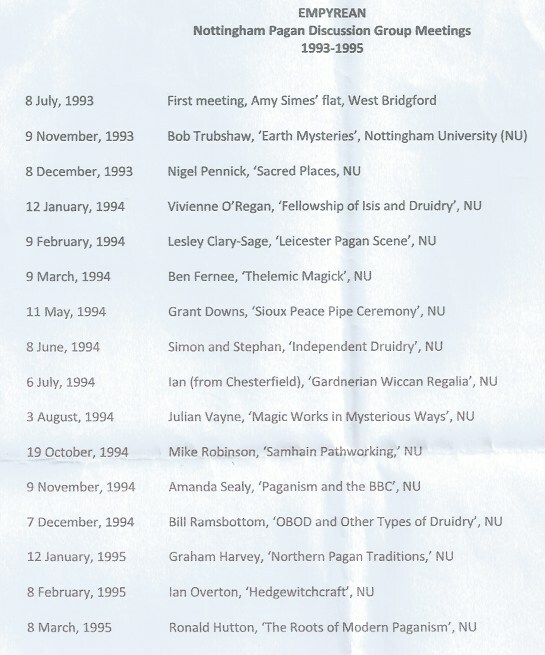 Apr 2011 Frank Earp "The Gods of Nottinghamshire"
Feb 2011 Alison Chester-Lambert "The Sun/Earth Environment"
Jan 2011 Esme Knight "Unlocking The Language Of Dreams"
Nov 2010 Russ Tanham and Karl Stirland "The Attraction Paradigm"
Sep 2010 Grahame Watson "I Built an Iron Age Roundhouse!" Jul 2010 Daryl Baxter "From Ghosts to Gods: Spirituality in the classical world"
Jun 2010 Lynne Tann-Watson "Introduction to herbs/food from Hedgerows"
May 2010 Lapis Lazuli "A Beltane Ritual In Dance"
Apr 2010 Gordon the Toad "Everyday Shamanism"
Dec 2009 Anna Franklin "The Traditions Of Yule"
Nov 2009 Mark Graham "Druidry"
Jul 2009 Rosemary Robb "Ghosts, Legends and Mysteries"
Jun 2009 Christine Davies "Nottinghamshire Witchcraft"
May 2009 Joan Cook and Sue Allen "A Chanting Workshop"
Apr 2009 Carol Barstow "Historical Tea, Coffee and Chocolate"
Mar 2009 Geoff Blenkinsop "Anglo Saxon Heathenism"
Jan 2009 Erick Henderson "Prosperity and Abundance"
Sep 2008 Nicky Greenwood "Fruits of the Hedgerow - a Circle Dance Harvest"
Apr 2008 Gary Morley "Ayahuasca: Plant Spirit Medicine"
Nov 2007 Lapis Lazuli "Bellydancing: The Goddess Within"
Oct 2007 Dan Billings "Extreme Pumpkin Carving"
Sep 2007 Russell Archer / Jackie Brown"Quantum Thinking"
Jul 2007 Paul Newman "Voice Magic Workshop"
Jun 2007 Bob Trubshaw "What do we know about England's sacred sites?" May 2007 Jodie Gray "The Essentials of Aromatherapy"
Apr 2007 Camille Fox "Witchcraft and Astrology: Four of the Elements"
Mar 2007 Patrick Harding "In Praise Of Trees!" Feb 2007 Margaret Harrison "Pub Ghosts Of Nottingham"
Jan 2007 Dave The Fletcher "Arrow Making And Flint Knapping"
Dec 2006 Everyone! "Yuletide Social Event"
Nov 2006 Pat Dunniclife"Drumming Workshop"
Oct 2006 Jacq Dobson & her group "Reiki - a Practical Introduction"
Jul 2006 Mary Clarke "The Journey Of The Fool (Tarot)"
Jun 2006 Lesley Acklam "Walking The Labyrinth"
May 2006 Moira Stirland "Personal Empowerment Workshop"
Mar 2006 Michael Nuzzo "Aura Maintainance For Daily Life"
Feb 2006 Dr Charles Tebbs "Teaching Plants Of The Peruvian Amazon"
Jan 2006 Finian Heavey "Female Magicians Of The Golden Dawn And The Goddess"
Dec 2005 Patrick Harding "4000 Years Of Christmas"
Oct 2005 Angie Denman "Houses In Astrology"
Jul 2005 Frank Earp "Nottinghamshire Mummers And Guisers"
Jun 2005 Sarah Yates "Cats And Magic"
May 2005 George Chaplin "Thornborough Henges"
Apr 2005 Jeanne Thompson "The Earth As Goddess - A Pagan's Relationship To The Natural World"
Mar 2005 Finnian Heavy "Magic And The Quabbala"
Feb 2005 Mick Lawlor "The Wonder Of Crystals"
Jan 2005 Dr David Marcombe "St Edmund's Chapel, Lincs - A Spirtual Site From Neolithic times"
Dec 2004 Elaine Mein "Amulets, Symbols & Talismans"
Nov 2004 Diarmid "Circle Dancing"
Oct 2004 Anna Franklin "Wise Women and Cunning Men Today"